"the most relevant and powerful work at the fringe"
There will be five street performances of Human Body Project Vulnerability Vigils. The vigils will be held near fringe venues in downtown Victoria. Aug 26-30, 5-6 pm. Human Body Project Vulnerability Vigils, as a form of street performance, will be part of the site-specific pieces at the Victoria Fringe. Tasha has been holding Human Body Project Vulnerability Vigils at least once a month since January 2012. Lately, she has been using the extinction symbol on her sign (@extinctsymbol), a symbol created to draw attention to the global extinction crisis. She will also bring the VULNERABLE sign and other words. The Human Body Project is a mainstage show in the Vancouver Fringe (six shows, Sept 4-14). 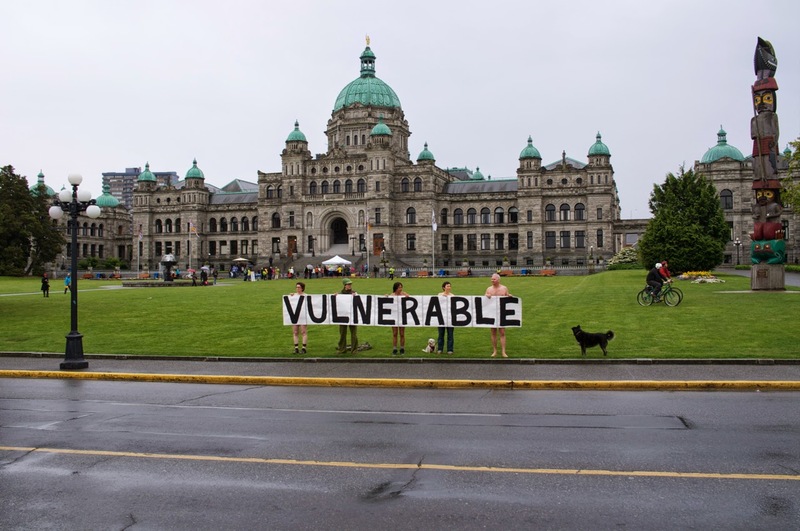 Tasha is also holding a free Human Body Project Workshop during the Vancouver Fringe (Sept. 12), after which she is holding a Human Body Project Vulnerability Vigil.